Photo Courtesy of Tasty Tails. Craws and Clams! Crawfish season is upon us and the excitement I reserve just for this is on the same level as my excitement for Texas State Fair fried foods, fried chicken and Backstreet Boys. The endless pounds of delicious, fat, mud bugs that’ll put me in a dreamy state of seafood coma sub-consciousness will probably require someone to sedate me so I don’t injure myself shoveling food in my mouth and accidentally choking on a claw. If you share the same enthusiasm about crawfish, or seafood in general, I have great news for you: I am prepared to dub Tasty Tails the best crawfish in Dallas. Khanh Tran and Vu Tran opened the crawfish joint last April in hopes of bringing an authentic New Orleans style of crawfish to the seafood scene in Dallas. The eldest brother, Khanh, moved to Dallas 15 years ago from New Orleans and brought with him recipes he learned from family and friends during the 20 years he lived in Louisiana. After many years of hosting crawfish boils at home, Khanh dreamed of opening a crawfish joint for years and finally made it happen. Before the opening of Tasty Tails, Khanh worked as a theatre installation specialist and Vu attended school for court reporting, neither were really want they wanted to do with their lives. So, when the opportunity to take over the 200 sq. ft. space that once belonged to a Thai restaurant presented itself, they jumped on it. At any given day of the week, the Tran family — which consists of brothers Khanh, Vu, Michael, sisters Juliee, Charlye, Vi, Alex, and a number of cousins and close friends — are manning the restaurant and serving lines of people waiting to get their crawfish fix. The family business is young and energetic and eager to share good New Orleans Cajun-style cooking. 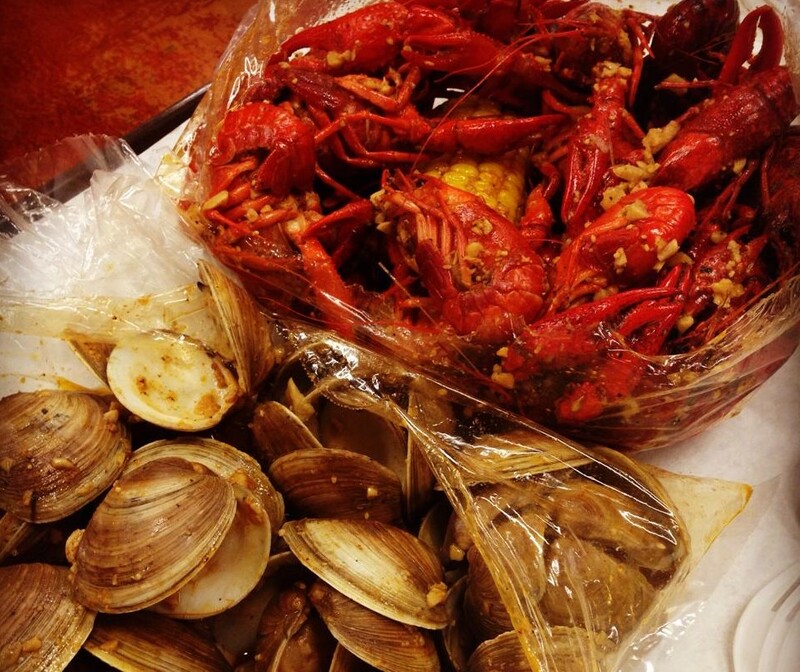 Over the past year, popularity for the charming seafood joint has spread through social media and word of mouth. Khanh believes the quality of food and freshness of product has customers returning for more and telling their friends. The Trans take extra steps to ensure the freshness of all their products and fly much of it in from Louisiana vendors. Tasty Tails is known for the large sizes of the crawfish, especially during peak season, because they take the time to find the right vendors with the best crawfish and pay the premium for it. Anything dead is thrown away and never served customers. Juliee explains their crawfish is first boiled in different seasonings, spices, and other secret family ingredients to really fuse the many flavors into the meat of the crawfish. They do the same with their shrimp, clams, and crabs. Customers choose between the traditional New Orleans flavor, where the crawfish is cooked in various spices, fruits, and veggies or with the Who Dat sauce, which is the traditional crawfish with added garlic and butter(for those who really need their butter), and whatever the level of spiciness they can handle. “That’s how we would eat it from back home. Dallas people aren’t used to eating it this way without the garlic butter or dry rub. We thought why don’t we try and introduce it to Dallas since it’s hard to find in Dallas,” said Juliee. Tasty Tails offers different flavor options to their crawfish lovers to achieve a bigger goal outside of just satisfying hungry bellies. The menu extends past just seabugs and offers po’boys fully stuffed with shrimp or catfish, fried catfish or shrimp baskets, gumbo, and of course sides of corn, potatoes, sausage or Cajun fries. You’ll also find specialties items such as crawfish pies and turkey necks. The Trans emphasize the authenticity they are bringing to each seafood lover’s plate and are doing a bang up job. Before even reaching the shops one year anniversary, there are talks of opening a second Tasty Tails location possibly later this year. No locations or contracts have been inked yet, but Khanh hints it would be an expanded version with more featured New Orleans-native menu items such as charbroiled oysters and hand grenades, reminiscent of Bourbon Street. 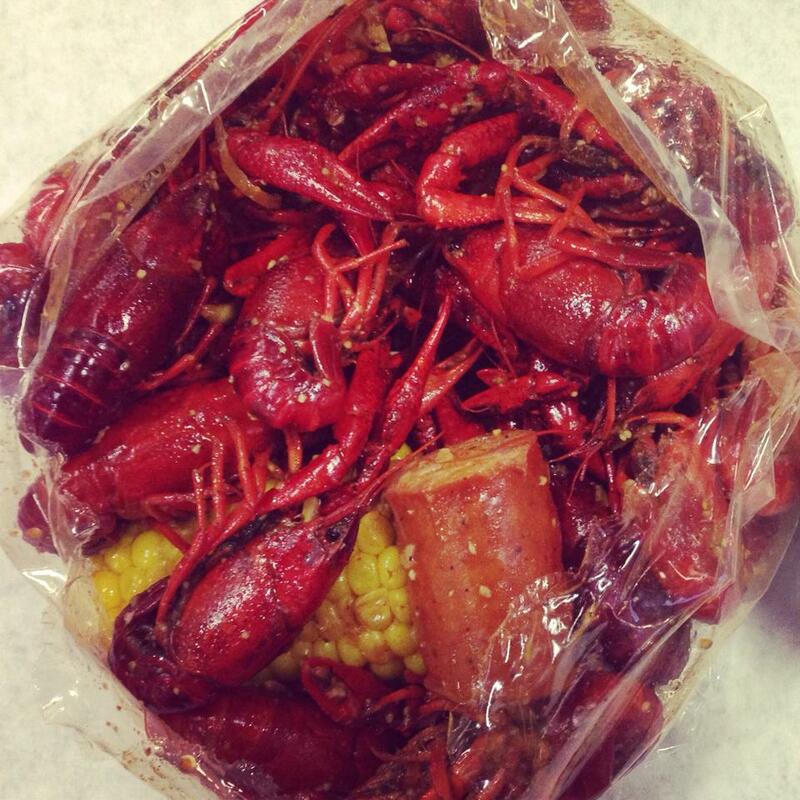 Love for the bags of delicious mud bugs is evident in how often the restaurant sells out. When asked how they handle the demand, Khanh says they only purchase enough for the day to guarantee the freshness. Keeping crawfish overnight effects the freshness and the taste and just simply isn’t an option. Easily selling thousands of pounds a month during busy season, it is easy for the restaurant to sell out of crawfish at least several days throughout the week on a regular basis. This is one indication they have some serious crawdad fans. The food court holds up to 200 people, and at one point or another, it is filled with mostly diners cracking and peeling their dinners. 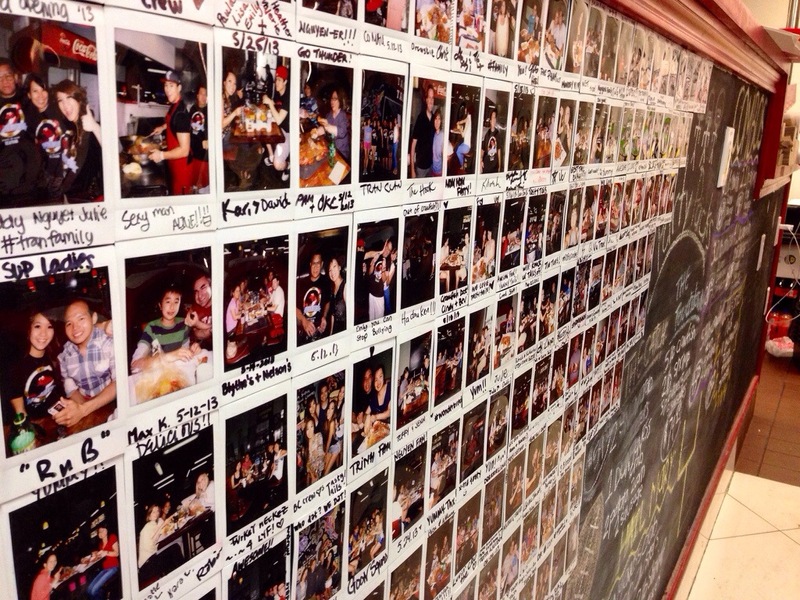 Wall of Fame: Polaroids of customers are put up on the wall. 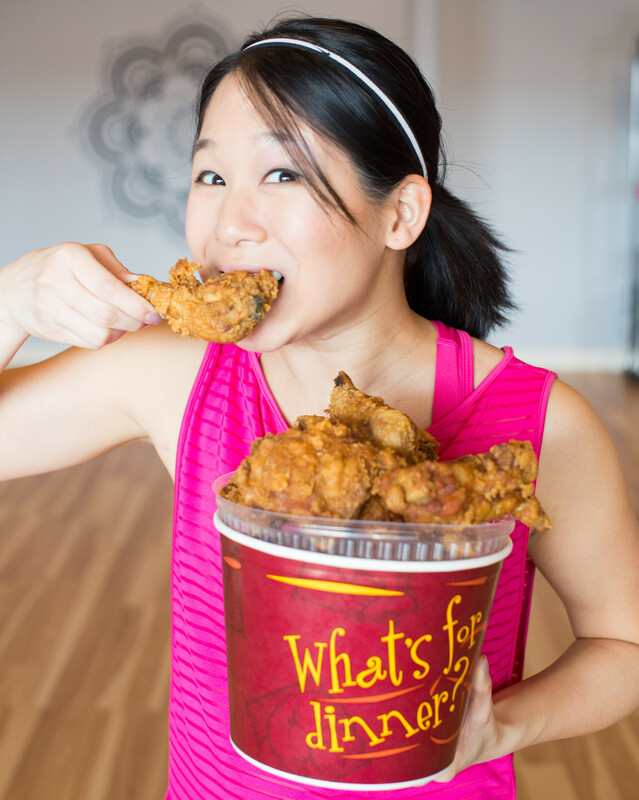 Regulars know better than to just show up, knowing there’s a chance of food running out. They go as far as calling to reserve several pounds of their favorite crawlers before arriving or checking for availability and even sizes. What makes Tasty Tails truly special doesn’t stop at the delectable menu or its unique location (Did I mention BYOB?? Just wanted to be clear). It’s the family ties that has really made the restaurant successful. “I’m most proud of my family. The way they supported the restaurant. They all have full time jobs and still come out here at least two or three times a week just to help out. We make it fun. We don’t run it like a corporation. 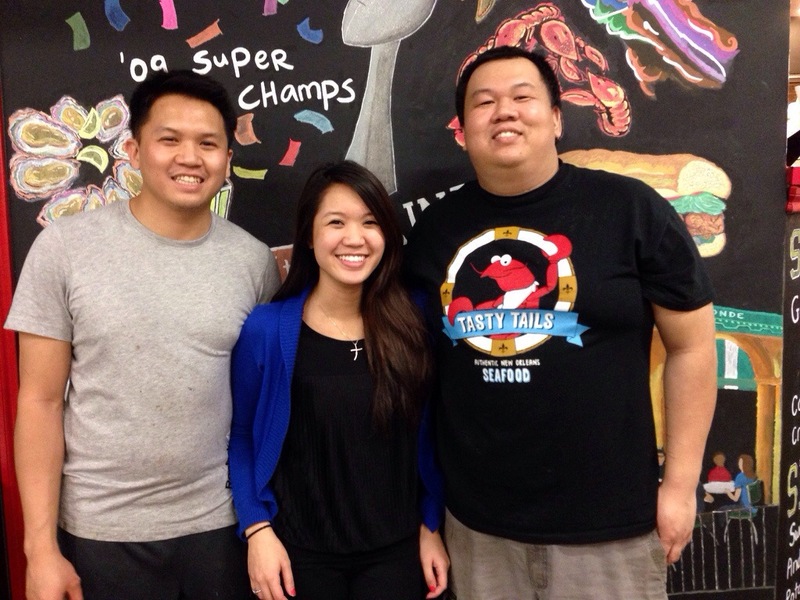 We chill and have fun,” Khanh said. Juliee acts as their main social media point person and despite working full time for a digital marketing and advertising company, makes it out often to help out. “It’s a family thing where we want to see each other succeed and help them get to where they want to be,” she said, “It’s rewarding because they work so hard. It brings us all together. We already hang out a lot together as a family, but this gives us an excuse to hang out even more”. Good day! I know this is kinda off topic nevertheless I’d figured I’d ask. Would you be interested in exchanging links or maybe guest writing a blog post or vice-versa? My blog covers a lot of the same topics as yours and I feel we could greatly benefit from each other. If you happen to be interested feel free to shoot me an email. I look forward to hearing from you! Wonderful blog by the way!